I held off watching Agent Carter when it was on due mostly to disappointment fatigue from Agents of SHIELD (which, by all accounts, continues to be exhaustingly mediocre), and — more importantly — because I was worried about the first big female-led Marvel show flopping and dooming us all to another decade of CGI sausage parties. But between rave reviews and hearing that it had been renewed for a second season, I figured I could safely give it a try. And I’m here to tell you that you need to watch it right now. It. Is. Delightful. It strikes just the right balance between camp and drama — something that neither SHIELD nor Daredevil managed, in my pompous and largely irrelevant opinion. And the interplay between Peggy and the rest of the cast is near-perfect. My favorite dynamic is probably Peggy and Howard Stark’s butler Jarvis*, who do a not-so-subtle gender role reversal with one-another. 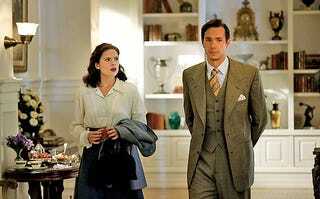 Jarvis as a fluttery domestic house-husband/butler, Peggy as a stern work-a-holic struggling with office misogyny. And there’s no romantic subtext. It’s great. Chad Michael Murray, meanwhile, reminds us why you haven’t seen much of him lately and I’m hoping beyond hope that they’ll find a way to shake off his character next year. In general, the show is light and fun but still manages to employ “consequences” that feel well-earned. I don’t want to say too much more to avoid spoiling anyone, but if you have been on the fence about watching this, waffle no more! And if you have seen it and would like to yell at me about why I’m wrong, please do! *This is probably one of the only moments of heavily, groan-worthy canonical winking, but Jarvis’s James D’Arcy quickly overcomes the one-note joke of his character’s name.